Bringing a new drug to market is a costly time-consuming process. Increased regional and international regulation over the last twenty years, while necessary, has only served to amplify these costs. In response to this escalation, developmental strategies have shifted towards a more global approach. In order to create the most cost-effective and safe processes, it is critical for those bringing drugs to market to understand both the globally accepted regulations and the local variations. 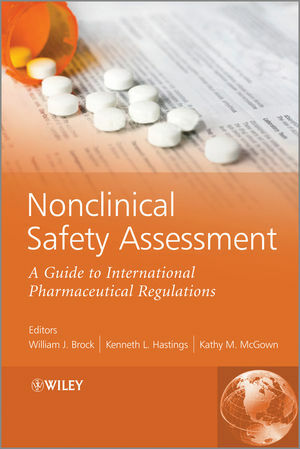 Nonclinical Safety Assessment: A Guide to International Pharmaceutical Regulations provides a practical description of nonclinical drug development regulations and requirements in the major market regions. Primarily intended for those professionals actively involved in the nonclinical and clinical development of a pharmaceutical product, including toxicologists, pharmacologists, clinicians and project managers, this book provides a roadmap for successful new drug approval and marketing. Dr. Bill Brock is Principal of Brock Scientific Consulting and manages R&D programs for clients in the pharmaceutical, chemical, food and consumer product industries. He is the Past-President of American Board of Toxicology, serves on the Board of Directors for the Academy of Toxicological Sciences and is an Associate Editor for the International Journal of Toxicology. Dr. Brock has served in a leadership capacity in various organizations within the Society of Toxicology, the American College of Toxicology and is co-chair of the nonclinical section of the Drug Information Association. Dr Hastings was Associate Director for Pharmacology/Toxicology in the Office of New Drugs, US Food and Drug Administration, from 2003 to 2007. He currently is Associate Vice President for Regulatory Policy at sanofi-aventis. He has served in several professional societies, including the American Board of Toxicology (currently President), the American College of Toxicology (currently President-Elect), the Society of Toxicology (Past President of the Immunotoxicology Specialty Section), and as Co-Chair of the Nonclinical Special Interest Committee of the Drug Information Association.